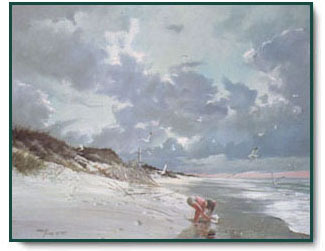 The popularity of Carolyn Blish's art has made it an American standard. She transfers her own delight in her subject matter right into her canvases. She has an endless fascination with her subjects: the ever-changing moods and rhythms of the shoreline, the undulating shapes of the dunes, flowers, children, and woodland subjects - all are images that offer authenticity without artiface. They are, she says, images that "call me to be painted" Blish's art is indeed a celebration of life. The Conch Shell copyright© 1988 by Carolyn Blish.